Fourscore and a million years ago, I wrote about the reported benefits of earthing and grounding. At the time, I was only prepared to practice earthing, or treading barefoot upon the earth. That’s mainly because earthing is free. It doesn’t require special equipment, and it is reportedly the most natural and effective way to benefit from the earth’s frequencies. At that time, we lived on a wooded, two-acre lot. Whenever I let out the dog, we’d hit the trails barefoot. After a few sessions, I realized why earthing is harder than it seems. Delicate feet don’t enjoy rugged terrain, and I wasn’t hyped about getting calloused-up just so that I could bare it. In our mini wildlife sanctuary, startled snakes and spiders feel obligated to defend themselves when unfamiliar feet get too close for comfort. Wet weather creates puddles, the perfect homes for mosquitoes and ringworm. Cold weather left me shivering long after I can indoors. Earthing is ideal when you live in the Bahamas. Otherwise, it takes some getting used to. Now that we live on a grassy, one-acre lot, it’s easier to practicing earthing. Fewer wildlife threats and cuts on my feet make me a happy gal. I often read and write outside with my toes in the lawn, or head to the mailbox barefoot. (I really don’t care what my neighbors say.) The only remaining challenge is cold weather. My husband found these cool earthing bands online. They mimic the effects of earthing, but they allow you to participate indoors when it’s cold out. 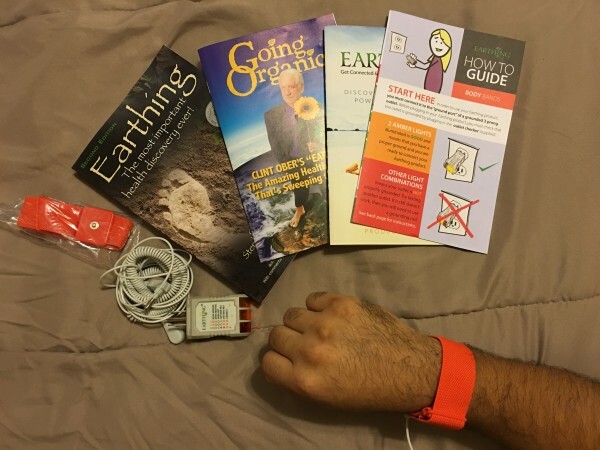 We received two grounding bands, two band-and-coil cords, a tester for the outlets, a book on earthing, and some literature. The bands are made of a comfortable blend of cloth and elastic. They’re adjustable and can be worn on the wrists or ankles. You must connect one end of the cable to the band and plug the other end of the cable into the wall in order to experience grounding. You know the three prong outlets? (Two thin vertical prongs with a cylindrical bottom prong?) You plug the grounding cable into the cylindrical bottom prong. The other end of the cable attaches to the band (as you can see towards the bottom of my husbands wrist). Does Earthing / Grounding Work? When it comes to earthing outside, it is hard for me to tell. I’ve always loved walking barefoot (my inner Floridian speaking) so being barefoot in the damp soil is as exhilarating as always. I feel grounded, happy, and capable when I’m earthing. I would conclude that earthing barefoot can be a mood and esteem booster, but I haven’t experienced any other effects so far. The earthing/grounding bands, however, brought instant results for my husband. He woke up the next morning feeling well-rested and rejuvenated. He said he dreamed better, too. Even when things at work are hectic, he doesn’t have stressful dreams when wearing the bands. I’ve been sleeping better since I started diffusing essential oils. I didn’t know it could get much better until the bands came along. The oils help me fall asleep faster and go back to sleep faster when I get up and got to the restroom. With the bands, I rarely feel the need to get up at all now. I go to sleep and stay asleep until the next morning. There is one area that left more to be desired. In the video that we saw on grounding, the host mentioned that a friend of his completely stopped snoring while he was grounded. At that time, he had two wires taped to his big toes while he slept. The bands did not provide similar relief for my husband, who still snores due to sleep apnea. (His snoring subsides when he wears his CPAP machine but the single cable and band alone have not stopped his snoring.) He is so satisfied with the quality of his sleep, however, that he is interested in getting an earthing pad. That would allow more of his body to be grounded during rest and may have a greater effect on his snoring. Could you elaborate on how the bands work that you wear at night. There is a cord that is attached to what exactly? The bed? I’m not getting a clear picture of how it actually works. Thanks for the heads up! I elaborated a bit more after the 8th paragraph.